Many former colonies have a public holiday named Abolition Day or Emancipation Day that commemorates the abolition of slavery. For instance, Abolition Day in French Guiana is celebrated on June 10. It was first observed in 2012. 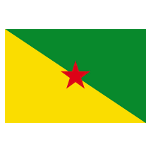 French Guiana, ofter referred to as simply Guiana, is an overseas department and region of France in South America. It was colonized by France in the late 18th century. In 1809, French Guiana was conquered by the Portuguese Empire, but in 1814 it was returned to France by the Treaty of Paris. The French established plantations to grow sugar, Cayenne pepper and other spices. They brought several thousands of slaves from Africa to work on these plantations. On April 27, 1848, the government of the French Second Republic abolished slavery in all French colonies and protectorates. But why is Abolition Day in Guiana celebrated on June 10? The matter is that it took time for the news to reach French territories in the New World. News of the decree finally reached French Guiana on June 10, 1848. That is why Guiana celebrates the anniversary of the abolition of slavery in June. As the holiday was established not so long ago, there are no specific traditions of its celebration yet.